Hero Histories: Can you fit a not-so-jolly Green Giant under your evergreen? Can you fit a not-so-jolly Green Giant under your evergreen? Pre-dating the "Ho-Ho-Ho-ing" frozen vegetable spokesman by over a decade, a radically-different, costumed, Green Giant appeared in (what else?) Pelican Publications' Green Giant Comics #1 (and only) in 1940! 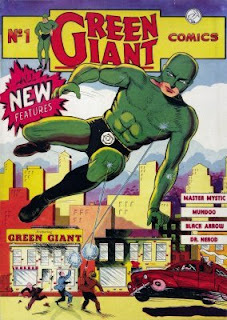 The emerald hero was secretly Mr. Brentood (no first name given in the tale), who beat Marvel's Henry Pym at the size-changing game with a costume which enabled him to grow to between 15-150 feet (depending on who illustrated the story)! Less than a dozen copies of this incredibly-rare comic, which was distributed only in the New York City area, and valued at several thousand dollars each, are thought to still exist! But you, dear reader, can peruse his one (and only) story HERE! Atomic Kommie Comics™ has incorporated him into the Lost Heroes of the Golden Age of Comics™ line, in the Solo Heroes section, where characters with only one cover available to us (at the moment) go! 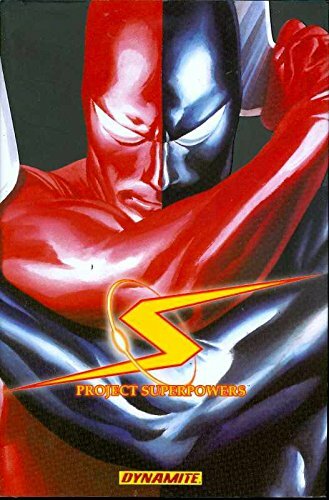 If you're looking for a retro-style Christmas gift for a Golden Age of Comics fan in your life, why not bundle one (or more) of our Green Giant goodies with the Project SuperPowers hardcover or trade paperback for a kool, kollectible present?